A crash on the M6 at Preston is causing delays to commutes this morning. 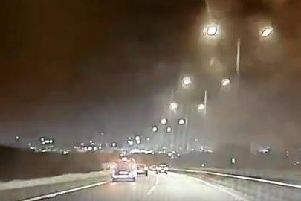 A silver Volkswagen Passat was involved in a collision at around 6.30am, near the northbound junction 30 slip road. The M6 at junction 31 in Preston is congested after a crash at 6.30am. Police have closed a stretch of lane 1 on the approach to the accident scene and 40mph speed limits are in force. The lane closure is causing some congestion but traffic is moving and all lanes are open after junction 31 (Preston (C), Blackburn, Clitheroe). Highways England warned of surface water on the northbound carriageway between junctions 29 and 31 earlier this morning. Drivers were advised to reduce their speed and "drive to conditions" on the affected stretch of carriageway. But the cause of the accident near junction 30 is not known at this stage. The occupant of the vehicle is being attended to by ambulance crews.